Look at the patient's face. 2. What could be the probable diagnosis ? 3. What could be the causative organisms? 1. What could be the possible diagnosis ? What is the role of siegalization in this patient ? 3. 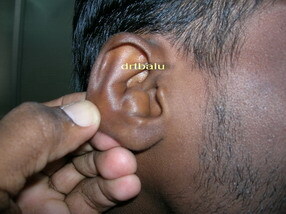 Glomus jugulare - associated with pulsatile tinnitus, conductive deafness, positive Brown's sign. CT scan shows eorsion of jugular foramen. What differential diagnosis you can offer ? Three fingers are used to perform this test. How will you manage this condition ? Needle aspiration with application of compression dressing to prevent reaccumulation. What will happen if the patient has a paralytic labyrinthine lesion ? What will happen in the presence of an active irritative lesion ? 5. 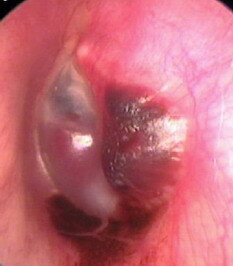 In the presence of an active and irritative lesion the patient cannot perform this test. The patient is asked to stand with eyes closed and hands outstretched. He is instructed to march on the spot. H/O Right ear discharge on and off - 3 months. How could the infection from ear spread to the parotid gland ? Spread of infections from mastoid and vice versa can occur through fissures of santorini. 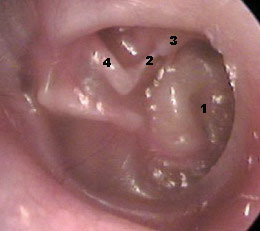 This fissure is present over the cartilagenous portion of the external auditory canal. Why is this area preferred ? This is endaural incision used for mastoidectomy. This area is devoid of cartilage. Why is this external auditory canal narrow ? What could be the clinical problems faced by the patient ? What surgery should be performed in this patient ? Exostosis of external auditory canal. It is common in swimmers. These patients have conductive deafness, cerumen impaction. 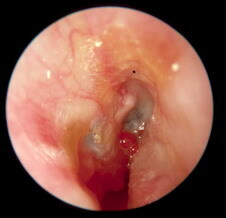 Cerumen impaction is caused by abnormal self cleansing mechanism of the skin lining external canal in these patients. Which cell gives rise to this condition ? 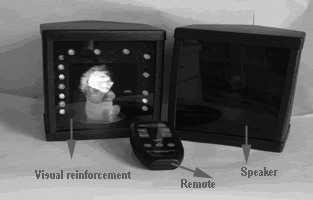 It is a visual response audiometer. 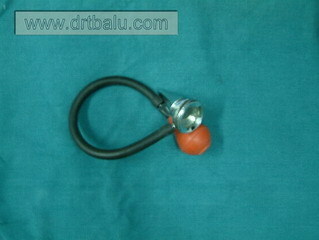 It is used to screen infants for hearing disabilities. 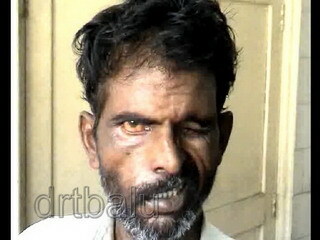 The patient shows blue sclera both eyes. Possible diagnosis is osteogenesis imperfecta. It is characterized by brittle bones, blue sclera and fixation of foot plate of stapes. This laddergram indicates complete recruitment.. Recruitment is common in cochlear deafness. It is not seen in retrocochlear deafness. 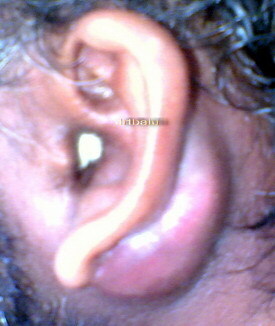 30 years old male patient came with complaints of foul smelling discharge from his right ear - 10 days. He also complained of mild pain in the right ear. Itching ++ in right ear. Comment on the otoscopy picture. What could be the possible diagnosis? 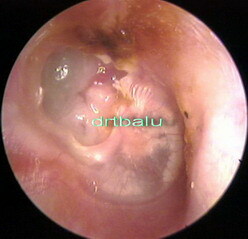 Otoscopy picture shows a tongue of granualtion tissue over the inferior quadrant of the ear drum. Ear drum is probably intact. Diagnosis - ? Myringitis granulosa. 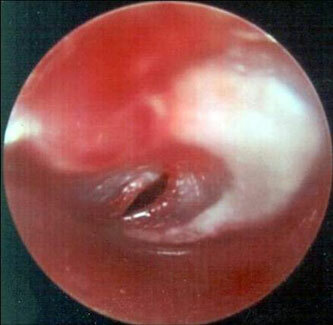 Mobility of ear drum should be tested to rule out ear drum perforation. 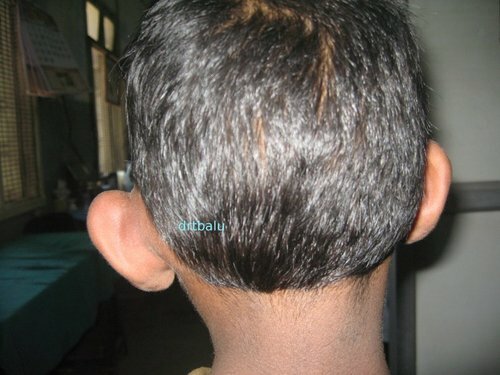 12 years old female patient came with c/o swelling in front of right ear 4 years duration. What complications could it cause? What is the ideal treatment modality? Name some syndromes associated with it? The diagnosis is infected preauricular sinus. It can get infected and abscess formation in that area can occur. Surgical removal of the sinus tract completely is ideal. Should all patients with preauricular sinus undergo ultrasound abdomen? No not necessary. To identify those patients who require abdominal ultrasound Wang's criteria should be used. It is a tympanometry recording showing Type a curve. What does this curve indicate? 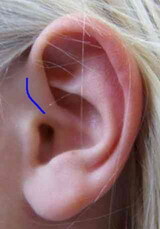 This curve Suggests normal middle ear function. The compliance peak occur between -150 - +100 dapa. The value of compliance ranging between 0.2 - 2.5 millimhos. This type of curve is also known to occur in early stages of otosclerosis. 7th cranial nerve and 8th cranial nerve functions can be tested by performing this investigation. 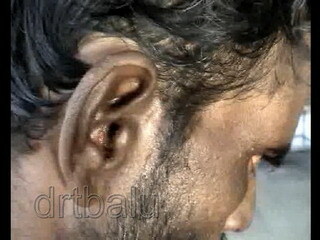 Ear drum on both sides appeared normal. They also showed normal mobility on siegalization. 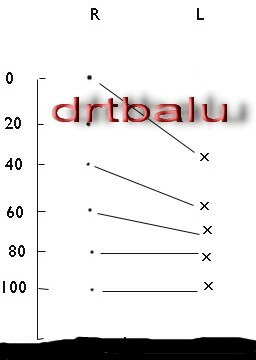 What do you see in the audiogram? 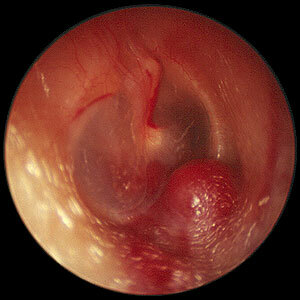 This patient is probably suffering from otosclerosis. 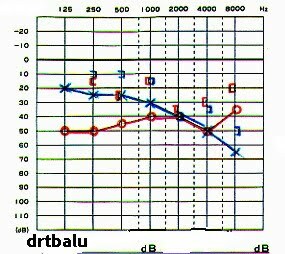 The audiogram shows carharts notch. It is classically seen in bone conduction audiogram of patients as a dip centered around 2000Hz. Can you name the most probable diagnosis? How? 2. Patient gives history of URI.